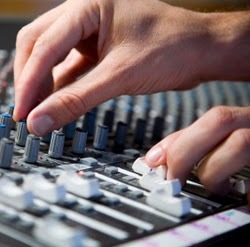 Today, I read an article on Prosoundweb.com about recording live to 2 track recorders. It was written by Mike Sokol and provided by "HOW To Church Sound Workshops". I would like to say that I have used this same method for recording live to 2 track straight off the mixing console. What Mike suggest here really does work well as an easy method of getting a quality recording from the main mix. Even though this article is for church sound, the methods will work with any basic, live sound, recording setup. Mike mentions using a CD recorder to make the recording but, you could also use other types of two track recorders for the job. Personally, I made a live, 2-track recording using one of the Tascam DR05 handheld, digital recorders and the results were really good. You could also do a throwback to earlier recorders like a DAT recorder, or even a cassette deck. The method will work with any kind of two track recorder.